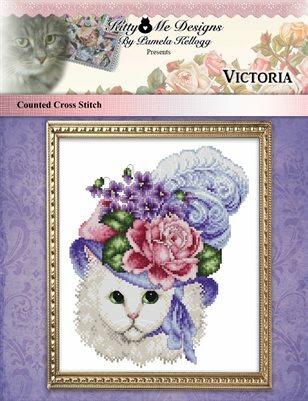 Victoria is a beautiful white cat wearing a Victorian style hat with a rose, violets and pretty feather designed by Pamela Kellogg. The stitch count for this design is 102 stitches wide X 126 stitch high. On 28 count Evenweave over 2 fabric threads, the finished stitched area will be 7 1/4 inches wide X 9 inches high. Large print easy to read black/white symbol chart with colored backstitching lines.